Roosevelt, Theodore. 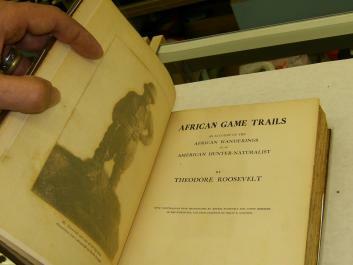 AFRICAN GAME TRAILS: An Account of the African Wanderings of an American Hunter-Naturalist. (New York: Charles Scribner's Sons, 1910) believed to be a First edition. With 50 illustrations from photographs by members of the expedition, including a portrait frontispiece and a map; the photogravures by Kermit Roosevelt and other members of the expedition and the drawings by Philip R. Goodwin, a number with protective captioned tissue guards. Large 8vo, in the publisher's original brown cloth, gilt-lettered on the upper cover and spine, top edge gilt, other edges untrimmed. xvi, 529, including appendices and index. A very interesting and pleasing copy due to it’s local Havre de Grace Connection. Previously owned by George L. Hopper of Havre de Grace. This copy contains numerous newspaper clippings glued into the binding from articles written on <?xml:namespace prefix = st1 ns = "urn:schemas-microsoft-com:office:smarttags" />Roosevelt. 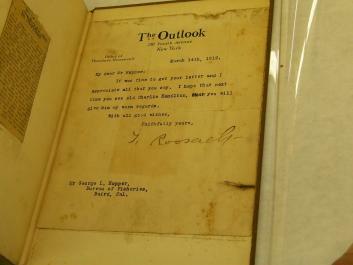 Pasted in the rear, the book contains a letter from Roosevelt himself on his letterhead from the Outlook, Office of Theodore Roosevelt typed and Signed. Also noted article cut out and pasted into back boards written to New York Sun 1919 from G.L. Hopper of Havre de Grace., plus letter to the editor article sent to the newspaper from Mr. Hopper. Note various newspaper articles pasted in throughout the volume. Their attachment causing discoloration in several places. Front hinge tender ,but still attached . ONE OF PRESIDENT THEODORE ROOSEVELT'S MOST DESIRABLE BOOKS and a fascinating and well written account by one of America's greatest sportsmen, as well as the 26th President of the United States. 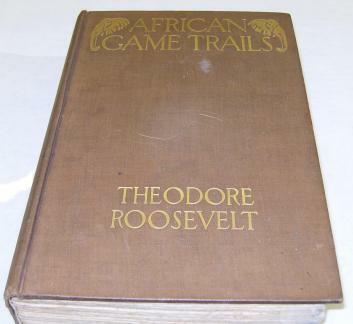 This work was the result of Roosevelt's ten month hunting trip through Central and Northern Africa, begun after leaving the White House in March 1909 and relates the journey from Mombasa through the mountain regions of British East Africa, to Victoria Nyanza, through the Congo and Sudan to Khartoum and on to Cairo via the Nile. As well as being one of the great books on big game hunting, it is also of considerable interest for the natural scientist.